Welcome to ‘Sandal Crazy this Summer ?’. I headed for my regular sandals this summer as it had been universally one of the warmest on record, and so with crazy dry days we could ideally go shoeless. So what might be the best sandal? I thought this month I would tease out some foot health thoughts when Irina, representing an Australian firm, kindly wrote to me about her new range of Aussie Soles branded as ‘Starfish’. I thought ‘oh dear, that’s one type of footwear I cannot get on with’ knowing the thong dividing the first and second toes was always uncomfortable. I had bought an expensive pair of flip-flops one year in New Zealand. Try as I could I did not get on with them. My interest grew as Irina highlighted the fact that many people found Aussie Soles helped with foot problems. As a podiatrist, I could not resist a challenge. Sandals may mean different things to different people, but in this article, I dip into flip-flops, the nations slip on soles for those days when it is warm and who wants to keep your foot closed in any way? Jason of Argonaut fame returned home having fled as a child to claim his father’s usurped throne from his wicked uncle aged 20 only wearing a sandal on his right foot. The mythical citation is unclear, although another Hellenic story suggests while escaping from Spartans, a man wore one sandal alone to allow better grip – his other foot slipping one assumes? So what more can we say about sandals? 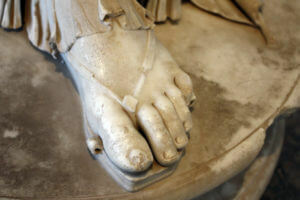 Sandals have a long history, they must do if we are talking about Ancient Greece. In the shoe museum in Northampton, a town famed as a shoe and boot manufacturing centre, weathered excavated sandals are on display and share a common feature with their modern day cousins. A flatbed and strap invariably separate the first and second toes for security. A quick look on wiki will give you a better idea of the history and essential facts, but my focus is on foot health as this is what ConsultingFootPain is about. With a science background and plenty of experience in the field of foot health, I was skeptical, but open-minded when Irina suggested these new flip-flops, which had become popular amongst podiatrists in Australia, had foot health benefits. Would I try them out? My pair of Aussie Soles arrived and yes, sure enough, the thong between the first and second toe was uncomfortable. I had agreed to try them out but with all the caveats about my likely rejection. “Craig Taplin (the developer of the Starfish flip-flop) conducted his own survey in 2010: he sent a questionnaire and a sample to 400 Australian podiatrists. 84% responded “yes” to the question whether they would recommend our Starfish product over traditional flip-flops. Well if we take 400 podiatrists and 84% responded, that’s 336 podiatrists. Using the Australian Board report there are just under 5000 podiatrists. So if there are say 4800 then 400 podiatrists represent 8.3% give or take. In contrast, the UK, Health Care Professions Council register gives just over 13,000 from May 2018. So here I was one podiatrist! Different names. Different regions for sandals. Some sandals in the UK are called flip-flops while in Australia they are thongs and in New Zealand, Jandals. Plakkies in South Africa. In the US we have slippers (Hawaii), Clam diggers (Texas) and Zories (East coast). The Romans used them as did other civilizations as suggested by the Greeks from which Jason (Argonaut) was one such character. Sandals have been around a good length of time. Most sandals require no socks, although Brit-man can be seen in hot climes wearing calf length stockings in sandals and looking pretty silly I’ve been told. I am now a reformed character and no socks are seen on me! The Japanese, who were seriously into class distinction and hygiene (probably in equal measure) used Tabis or socks which also had a divider for the big toe and lesser toes. These would then be used with Geta, a type of wooden sandal, but of course with the toe divide or thong. Modern sandals have been typified by the German-designed Birkenstock (1774) and more recently the Scholl exercise sandal from the 1900s. The former has a molded sole with arch built in. Without being unduly biased Irina’s request allowed me to explore flip-flops and consider the benefits for foot health. The contention that Aussie Soles were better than others is something I cannot comment on but I can share my experience. Sandals rather than flip-flops include a wider range of footwear design features and usually incorporate a heel. The material around the back of a heel has straps to fasten the ankle and is called a ‘counter or heel counter’. It holds the foot more securely than an open sandal like a flip-flop. Aussie Soles (Starfish), unlike many brands, has a usefully molded heel into which the hind quarter fits snuggly. The flip-flop also has a raised rim to seat the foot better. Birkenstock sandals are a molded sandal so the foot sits snugly on a pre-formed shaped insock. The ‘toe prop’ as we call the bunched up material lying behind the toes act as a cushion and aid better toe grip. Scholl’s built a contoured toe prop into their wooden sandals which gave this a unique feature. Podiatrists often spoke about this causing toe buckling with the hammering of digits, but I am not convinced this is true without other factors coming into play. Air-circulation is a top foot health benefit so anything designed with large areas of exposed flesh is good in the heat, so that skin will remain healthy and unaffected by a build-up of sweat and skin infections. The purpose of sweat is to act as a cooling mechanism and controls our body heat upon evaporation. If it accumulates and become less fresh, bacteria grow giving off a sour unpleasant odour we all know as B.O. The skin acid-alkali balance alters and other organisms are attracted that may cause problems. So the mantra should include changing footwear and socks regularly, and more so if the foot becomes over sweaty. A cool air circulating allows faster evaporation and reduces organisms. The most common heat created foot infection is called ‘mycotic (fungal) infection’ but everyone knows this as athlete’s foot. Like policeman’s heel, policemen have nothing to do with the condition any more than athletes have when it comes to a fungal infection. Anyone can suffer from these conditions without the occupational label. The mould that grows on bread and other food are the fungal hyphae. The skin peels leaving a dry border and occasionally forms small blisters (vesicles) within the rash, and does not develop the fuzziness created by the hyphae. The arch and inter-toe spaces are common sites for infection and if you have had the condition you will know how the itchy-sore develops. One of the first line treatments is to get out of wet or occlusive footwear and allow the air to reach the skin. Sandals top the bill and if you want to go for the flip-flop this works also. Of course, anything between the two toes could also add to an existing problem. 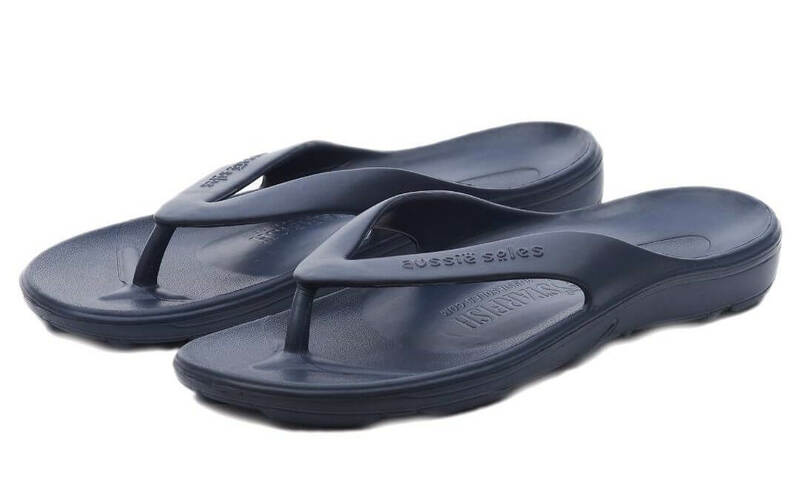 As an indoor cover they slip on and off easily, can be used in the shower, worn on the beach and protect the sole from hard items, except perhaps glass and sharp objects that could penetrate the sole. So hygiene and freshness come to mind. They might even minimise the risk of the virus called the verruca around bathing areas. When I first put my Aussie flip-flops on I noticed it had three deviations from the standard brand. A toe prop had been built in and a small arch raise. This was ‘Birkenstock-ess’ as these share similar shaped forms. Secondly, the arch or valgus filler was added. The blurb suggests ‘orthotic’ in its title. Tied to ‘flip-flop’ is pushing the description as it forms an impression that this is what it can do. It does not and neither is it likely to because badly shaped feet will not experience any control as this depended on a secure hindquarter. This is at least where straps are required. That said, everyone can benefit from footwear differently so it does not mean that some won’t find the effect of an arch design unhelpful. As a podiatrist, I always find it is important to keep an open mind. One size, as they say, does not fit all. Lastly, there was a molded heel seat and overall shell. Birkenstock and some Scholls have shaped heels but flip-flops do not routinely incorporate a heel as a general observation, and certainly not in the cheaper versions. The Aussie Soles (Starfish) are around £30.00 so they may not be the cheapest around. I persevered, persuaded by my wife who just loves flip-flops to hang in there. To my utmost surprise, I started to grab my thongs (not sure I like this word in the UK as we use it for another part of clothing!) in lieu of my regular sandals, a pair of trusted Clarke’s worn year in year out, or I would use my Crocs. I walked a flat distance of 1.4 miles in the Aussie Soles and had no problem. Another day it rained and I found out, as advised by my wise wife, that the foot slides in wet and is not ideal. Aha, I get it now, why the man escaping from the Spartans used just one sandal. Flip-flops are seriously unstable when it rains. The manufacturer suggests that the sole is slip resistant – maybe in Australia but not here in the UK. That said the foot slips on the upper part of the sole, not the underneath. Flipping the flip-flop over, the undersole has a series of starfish (guess that’s where the name comes from). These pentagonal arms are raised and do offer reasonable grip so slip resistant has to be considered depending which part slips or doesn’t. My experience with Aussie sole sandals. Do I like Aussie Soles? Yes, I am converted. I shouldn’t shout, but I love them! Easy to slip on, keep your feet safe and are best used in dry conditions, but of course with water and showers, you must be careful. Showers maybe okay where you do not move around too much. Are Aussie Soles good for your feet? Yes, they can they offer many positive benefits. Air circulation, hygiene. FF’s are washable and durable. I have had surgery on my foot for nerve pain and find that I experience no pain at all or numbness when wearing the Aussie Soles. For me, in this respect, if you have Morton’s neuroma, nerve impingement, then the flip-flop is great in the right weather conditions. The toe prop worked for me and I was surprised how comfortable and usefully they gripped without any strange sensations. It gave better purchase than ordinary flat beds F.Fs and the arch even more surprisingly was wisely contoured. My feet are not too bad and do not madly pronate so I do not need orthoses. Too many shoes crank up the arch height but the Aussies are not intrusive and are unlikely to irritate most people in this part of the foot. The thongy bit. Well, that takes a few hours of wearing in and over a period of 10 days I persevered and it paid off. I went back to my old flip-flops and they were not as comfortable with their fabric thong and they were too heavy. Everyone is going to have a different opinion here. Most people just put them on and away they go. The thong is solid material but early irritation disappeared thankfully. My original concerns ebbed away. The two straps that made a V rubbed the skin on top of my foot. This settled after a rest of two days and I had no further issues. Avoid a blister though if this or any shoes do rub. My wife’s pair, and remember she was a real F.F Mogul, found this happened to her as well. In the end, I did better and now they are a big favourite and used them every day that I was away on holiday. Getting back to closed in shoes after three weeks was pretty tough. Being light in construction they pack away easily down the sides of a full case and hardly add to that travel luggage weight, unlike my old flip-flops. What other things are valued in a Flip Flop (F.F) style? Bunions, bone projections, hammer toes are all going to do well. No pressure means no skin irritation. Relief from a painful burning arch pain would not convince me as a specialist in feet to go for F.F’s. The foot can come in many shapes and have many architectural problems associated with deformity of the inside foot. I would say heel pain might benefit from the cushioning and contoured sole, but I would be cautious to say the Flip-flop fits all types of foot ailments. As with any footwear you have to be careful to avoid heel skin splitting especially if prone to drying out. This was not a problem with the Starfish version of the Aussie Soles in my experience. Any unstable ankle or ankle tendon problem would need to be carefully assessed first. Flip-flops are not a stable form of footwear. I shouldn’t need to say don’t use them outside in winter in the UK with low temperatures, although inside they will be great. My advice could come down to two simple words, BE SENSIBLE and RESPONSIBLE (that’s three). Enjoy sandals or even Flip-Flops, they can be good for you and with the crazy summer we have just had, sandals are just what the podiatrist orders. Back in 2003, in Queensland Australia, Craig Taplin identified the need to provide orthopaedically designed footwear to meet the lifestyle and sports needs of the surfing community in nearby Noosa Beach. Using the latest technologies and innovative design, he developed a range of footwear that offered quality, affordability, and most importantly arch support: and the Aussie Soles™ brand was born! These extremely comfortable flip-flops (or thongs, whatever you prefer!) are made from our unique AusLite™ antibacterial polymer foam. They feature a raised arch for support, deep heel recess for extra comfort, and a tarsal bar that aids the elimination of toe clenching. Made from a single injection mold with upper strap molded into the sole for extra durability, the foam will soften with wear and mold onto your foot. This slip-resistant foam has a starfish design on the sole, cushioning your foot and leaving a beautiful impression on every beach! Thanks for reading ‘Sandal Crazy this Summer ‘ this article was written by David Tollafield. More articles can be found on consultingfootpain website and Footlocker. Disclaimer: This article received no financial inducements from the manufacturer or supplier of Aussie Soles. The views held are those of the author and the purpose of this article is to offer wider advice to readers and people suffering from foot problems. Advice and treatment should always be sought from trained professional foot health management.